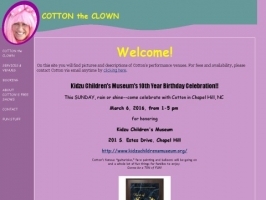 Cotton the Clown and cotton the Pink Poodle. Guitar Singalongs, Karaoke, Balloon animals, Face painting, limbo, magic, games, storytelling. Birthdays, events, festivals, stageshows, more. Singing telegrams too. Welcome TheAvinashKumar, the newest member.